Christopher C. Horner, author of Red Hot Lies, has a new book out from Regnery Publishing. 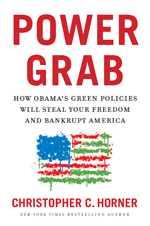 Power Grab: How Obama’s Green Policies Will Steal Your Freedom and Bankrupt America is an exposé of the Green Movement’s rise to political power and the frightening consequences of Obama’s Green-friendly energy mandates. Horner reveals who in Washington is driving this expansion of environmentalist policy and analyzes how new restrictions will harm economic recovery and development in America. Obama’s green jobs agenda masks a declaration of war against America’s most reliable sources of energy-coal, oil, and natural gas. He seeks to shut them down and convert America to green energy-mostly wind and solar-in an irresponsible experiment that will guarantee an energy crisis and drive America from recession to depression. The Obama administration, working in collusion with green groups allegedly protecting the environment, unions protecting their paychecks, and local elites protecting their ocean views, is putting the special interests ahead of your interests. “Under Obama’s economic and energy plans, conventional energy is punished by government policy in order to force the adoption of new, Obama-favored technologies. These plans will force us into energy poverty, a return to government-inspired uncompetitiveness, and a surrender of individual and economic liberties. “Chris Horner was right in his bestselling The Politically Incorrect Guise to Global Warming and Environmentalism. He was right in his book Red Hot Lies that exposed the cover-ups, lies, and intimidation of the global-warming alarmists. And he’s right again in his new book Power Grab, which exposes what the extremists are really after: power over you, your wallet, and even your right to self-government. Power Grab is essential reading for fighting back. Global warming ceased to exist, both as a concept and a reality – coldest winter in 31 years and a chilling spring. An article in a British newspaper suggested that if there was a global warming, scientist needed to explain very quickly –preferably with charts – why everywhere wasn’t getting hotter! I genuinely liked reading through your weblog posts, and I've added you to my Microsoft reader.